Planen Sie den perfekten Kurzurlaub in Naples im Bayshore Inn & Docks! Das Bayshore Inn & Docks ist eine Unterkunft mit 10 Wohneinheiten mit Zugang zum Kanal, die direkt zum Golf von Mexiko führt. Die Unterkunft befindet sich etwa 10 Autominuten von den Stränden sowie der Innenstadt von Neapel, Tin City und einer Vielzahl von Restaurants und Einkaufsmöglichkeiten entfernt. Dies ist ein Studio mit einer Küchenzeile mit Edelstahl-Geräten und Granit-Arbeitsplatte. Das Badezimmer hat Fliesen und eine geflieste Dusche. Entspannen Sie sich am Pool mit herrlichem Blick auf den Sonnenuntergang. Screened in Lanai bietet einen tollen Ort, um zu essen, zu trinken und den Sonnenuntergang zu sehen! Die Docks am Kanal bieten eine schnelle Verbindung zum Golf ohne Brücken. Docks können bis zu 26 'Boote mit einem Tiefgang von weniger als ca. 24 "aufnehmen. Sonnige Strände sind nur eine kurze Bootsfahrt oder Autofahrt entfernt! Zur Ausstattung gehören Xfinity Wifi und Kabel, alle Einrichtungsgegenstände, die Küche ist reichlich mit Geschirr und Kochgeschirr ausgestattet. Es gibt eine Waschmaschine und einen Trockner vor Ort am Eingang der Unterkunft. Dieses Studio verfügt über ein Kingsize-Bett. Für mehr Bilder oder Fragen, zögern Sie nicht uns auf Bayshore Inn & Docks in den sozialen Medien zu sehen! Wir freuen uns, Ihnen bei der Planung des perfekten Urlaubs zu helfen !! We thoroughly enjoyed our stay. The room is just as pictured and described. Very clean, had all of the amenities we were looking for. Nice little kitchen area, comfortable bed. The owner was present and accessible during the trip and great to work with. Just enough space for 2 people. The location is just 3 miles from the beach which is why we visited the area. There are lots of great restaurants nearby, some within walking distance. We definitely plan on coming back to stay here. 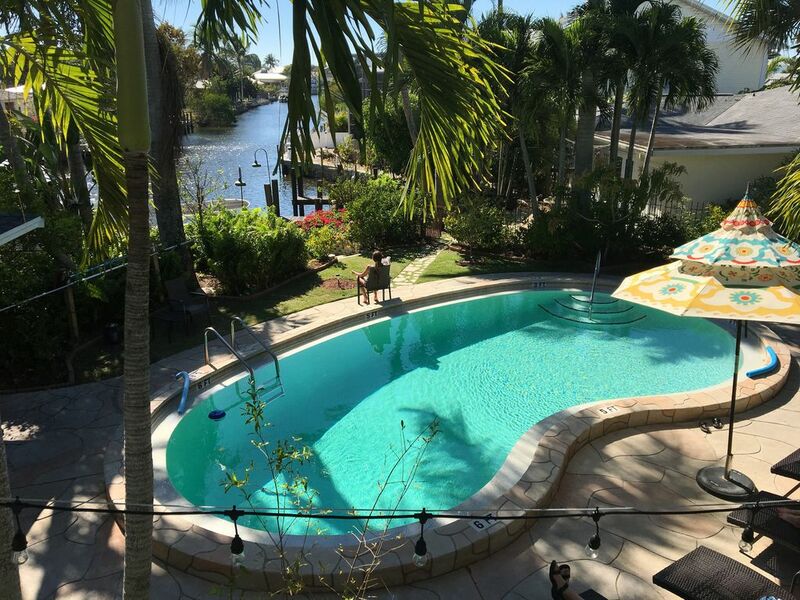 The location of the studio is perfect to explore Naples and Southwest Florida. The owner of the studio was very attentive during the booking process and during our one week stay. He always followed up to my questions in a timely manner. Although the studio is in an older complex, it is completely remodeled. The design of the remodel caused it to feel spacious for a studio. The owner provided everything that is needed and went beyond our expectations. The kitchen was fully equipped and had supplies such as dishwasher tabs, dishwashing soap, paper towels... The bathroom shower has a large shower head in addition to a smaller moveable one. The outside area of the complex has a heated pool, lounge chairs and tables, a small bar area and a grill to use in addition to a lanai area overlooking the canal. We enjoyed the pool even in cooler temperatures. There is one disadvantage to this studio. It’s on the second floor with no elevator. So if you have difficulty with stairs this is not the place for you. The back window of the studio does look out to Bayshore Drive so be aware that there is some traffic. However, it didn’t effect our sleeping. Overall, this is a terrific place to stay. We went to historic Naples, the area beaches, Botanical Gardens, the Everglades and some excellent restaurants. Also Celebration Park is three blocks from the studio. We had a wonderful visit to the Naples area. Try it out staying in this studio! I forgot to mention there is a Pickleball Academy closeby that my husband attended. He participated in a clinic and had a private lesson.